A special post today, short and sweet, in honor of the first night of a very early Hannukah…and because despite the recent trickle of indiebands doing Hanukkah albums, I can’t for the life of me find any folk covers of Hanukkah, Oh Hanukkah or Dreidel, Dreidel, Dreidel. Maybe it’s fitting to feature just one song today. 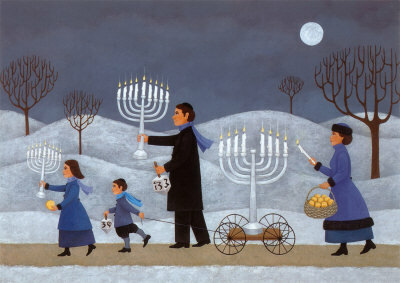 And maybe it’s fitting that it’s the best-known Hanukkah song, the one that’s become such a central part of the candle-lighting ritual itself. Here, then, just in time for tonight’s candle-lighting, indieguitarist Ben Kweller and folkbluesman Marc Cohn interpret Rock of Ages. The song is over seven hundred years old, but it’s still powerful in the right hands. We’ll be back tomorrow for a post of greater substance featuring some secular songs of the season. May your candles burn bright until then.